BarterDEX is a Decentralized Exchange (DEX) built by the Komodo development team. Find more info on their website. 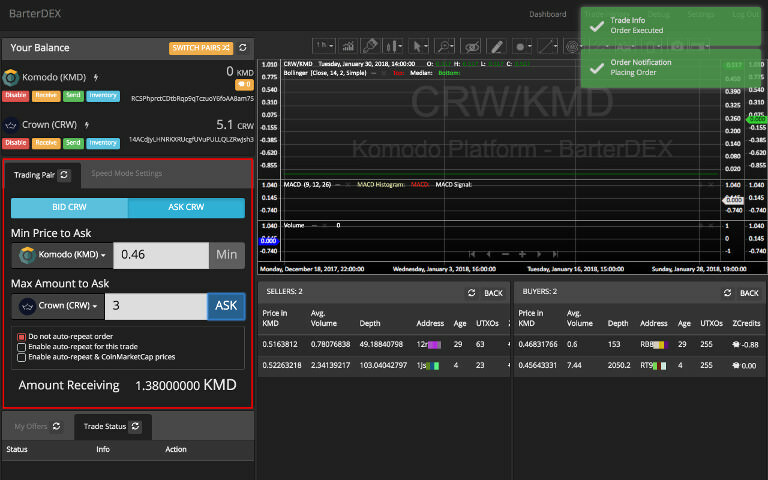 In this guide we'll show you how to install the client and perform a trade on the KMD/CRW exchange pair. KMD can be easily bought on several exchanges/brokerages, such as Bittrex, Binance, Cryptopia and Shapeshift. On traditional crypto exchanges like Bittrex, the exchange controls your funds, but allows you to perform trades. Only when you withdraw your tokens, the exchange hands over control of the funds back to you. This is where decentralized exchanges differ. In short, the DEX gives you access to your own public/private keypairs and provides a marketplace where you can find other bidders or sellers for your token. For instance, when you sell CRW for KMD, you send your CRW to the counterparty and they send you KMD at the agreed exchange value. The DEX facilitates this arrangement by automating the process, removing the need for trust (e.g. trust between the buyers, or a trusted middle man). Since the DEX does 'regular' transactions, the process is slower than on regular exchanges and may be more expensive per trade. The interface/UX is also notably less noob-friendly than most major exchanges. Keep in mind that for every trade you do, regular transaction fees (tx-fees) are used to send funds to the counterparty. Due to BTC's high tx-fees, KMD is a more popular base currency than BTC on BarterDEX. Furthermore, BarterDEX is not very liquid at the moment, which means it might be difficult to buy or sell larger amounts against global average market value. NOTE: our community member @debostic has created video guides on how to use BarterDEX. Find the macOS guide here and the Windows guide here! Go to https://github.com/KomodoPlatform/BarterDEX/releases/ and download the latest release for the Operating System you're using. Optional (Windows): right-click the file and select 'Create Shortcut'. Move the shortcut to your desktop. Optional (macOS): drag the file to your Applications folder. Double click the application to open it. You may need to click 'Allow' a few times to allow the application to bypass your firewall. The client may take several seconds to load. Once it has loaded, you will see a blank screen. This will happen every time you restart the client. 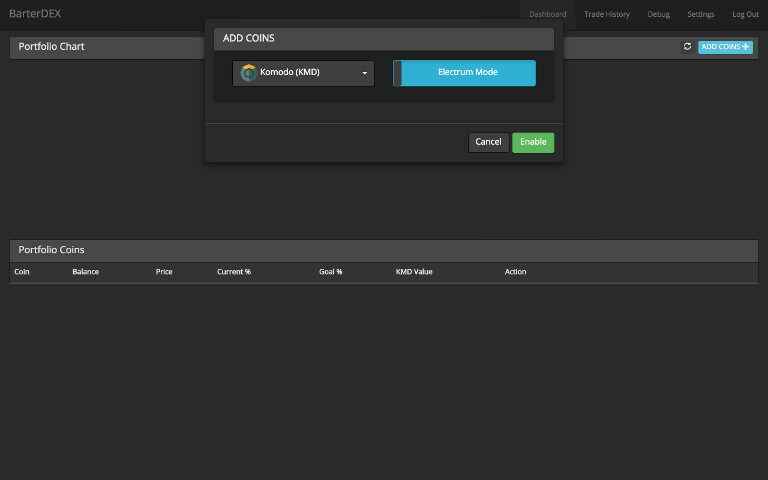 In the top right, click the ADD COINS button and find KMD. IMPORTANT: Flip the blue switch so that it says Electrum Mode. Using native mode provides better security, but requires extra setup steps. Click Enable. Repeat this process for CRW. Your KMD and CRW balances will now show in the bottom section. Click on the Receive button of the token you would like to sell. An address will now appear. IMPORTANT: BarterDEX makes the transferring and exchanging of funds a bit convoluted, so make sure to read the following steps carefully. The DEX utilizes UTXOs to be able to exchange funds between accounts. We won't go into detail on this too much (read the whitepaper here and search for 'UTXO' for more detail). This means if you want to sell 10 CRW, you send a 0.1, 1 and 11 CRW transaction (approximately). It is advised to send more small transactions as the amount you want to sell increases. If you want to sell e.g. 1,000 CRW, it should also suffice to send 0.1, 1 and 5 * 200. Go back to the home screen and click on EXCHANGE in the CRW row. You will now enter the exchange overview. IMPORTANT: BarterDEX is decentralized and thus not controlled by a third party. There are very few measures in place to save you when you make a mistake. Always double check the amounts and values before confirming a buy/sell order! Make sure to check the troubleshooting section at the bottom of the page if you get error messages. To sell your CRW tokens for KMD, click ASK CRW and set the minimum price (in KMD) you want to receive for it. In the field below, enter the amount of tokens you want to sell and click ASK at the side of the box (after double checking whether you filled everything in correctly). A green box will now show in the top right, confirming your sell order. To buy CRW tokens for KMD, click BID CRW and set the maximum price (in KMD) you want to pay for it. In the field below, enter the amount of CRW tokens you want to buy and click BID at the side of the box (after double checking whether you filled everything in correctly). A green box will now show in the top right, confirming your buy order. 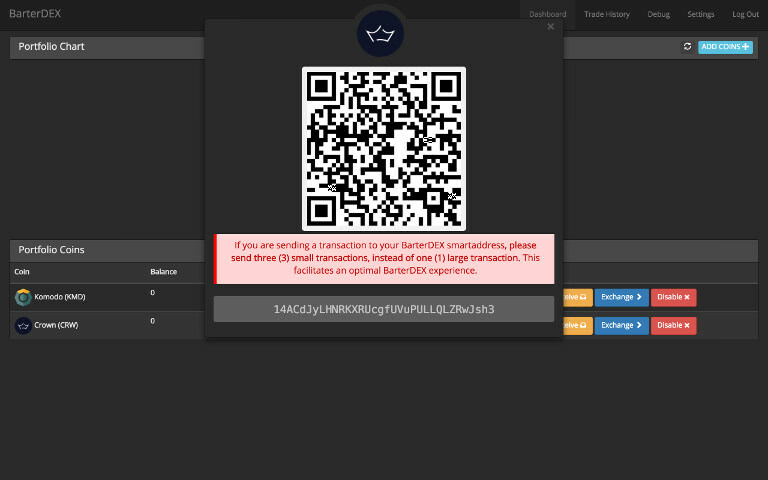 If your order was submitted successfully, BarterDEX will put it on the order books and automatically sell/buy if a matching counter-order is found. It make take up to several minutes (depending on the confirmation time of both tokens) for your order to actually show as executed. The balances tab should automatically update to show the new token balance. Congratulations! You have now successfully traded on BarterDEX! Check if you have the wallet set to electrum mode. If you're not sure, disable the wallet in the dashboard and add it again. Check if you have the required balance. If so, another option is to try sending more small transactions to the address you're selling from. Liquidity is still very low on BarterDEX. Most trades are conducted with KMD as base pair (see https://coinmarketcap.com/exchanges/barterdex/). Join us in the Public Trading channel on Mattermost where defunctec or myself might be able to help you.